This past year I've discovered a love of food illustration. This is really unexpected, as I'd never given it a thought as something I'd like to draw. 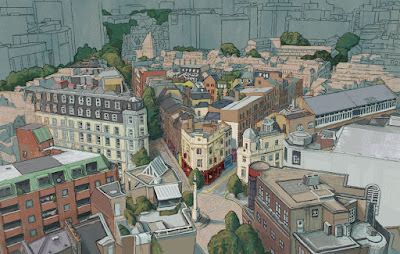 It began with another architecture drawing of London- the Seven Dials area of Covent Garden. Then I saw that a lot of food places were there, the Neal's Yard Dairy, a bakery, a macaroon patisserie, and a restaurant bar. 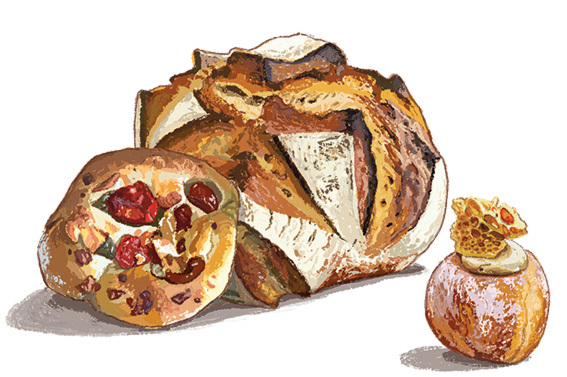 They each have a lot of beautiful food on show, and I wanted to turn it into a drawing which could work as a magazine spread. 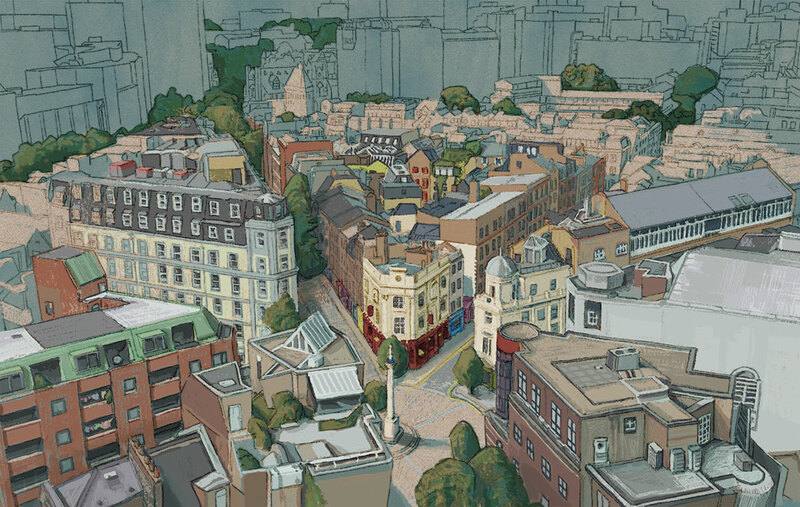 To start with, the base of the drawing would be 7 Dials seen from above, and in research I discovered the 3d button on Google Earth. After spending an afternoon flying around the rooftops of London like a virtual Mary Poppins I started to block out the buildings. The plan was to keep it loose but not too sketchy, and also keep a chunky feel to the buildings. 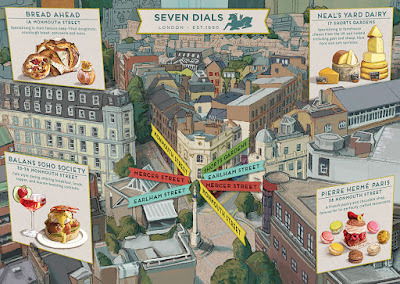 The base drawing, where the 7 streets meet, with a sundial obelisk in the centre. 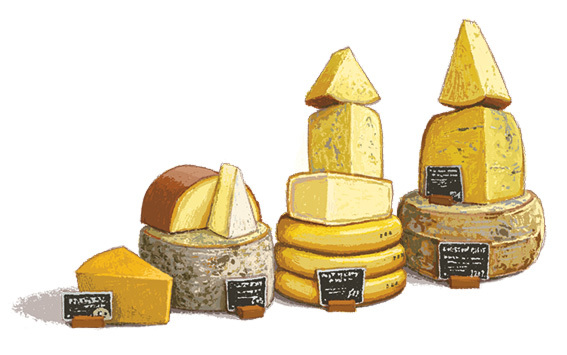 I'd already drawn some cakes earlier last year, but it was good to tackle something savoury. The idea was to make it really 3d and colourful, and also take loving care of the way it was shaded. It gave the food a storybook quality, traditional but still fresh with colour. Some food illustration can be a bit too sketchy for my taste; which made me realise that the food could look really appetising if it was very full bodied, with glaze on sauces and shining colour in the drinks (basically, pimp that food up). 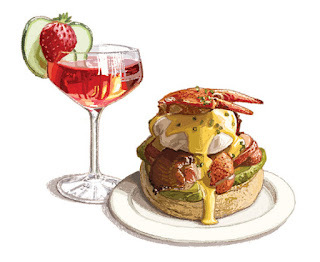 Balans Soho Society- Eggs Benedict (with crab claw) and Pimms. Bread Ahead- Sourdough loaf, cherry tomato ciabatta and their special cinder toffee doughnut. Neal's Yard Dairy- totemic cheese stacks. 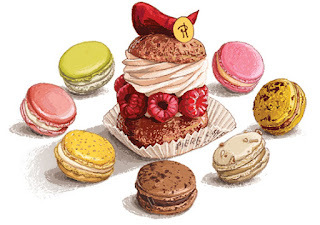 Pierre Hermé Paris- dancing macaroons. The final piece, with everything in place. 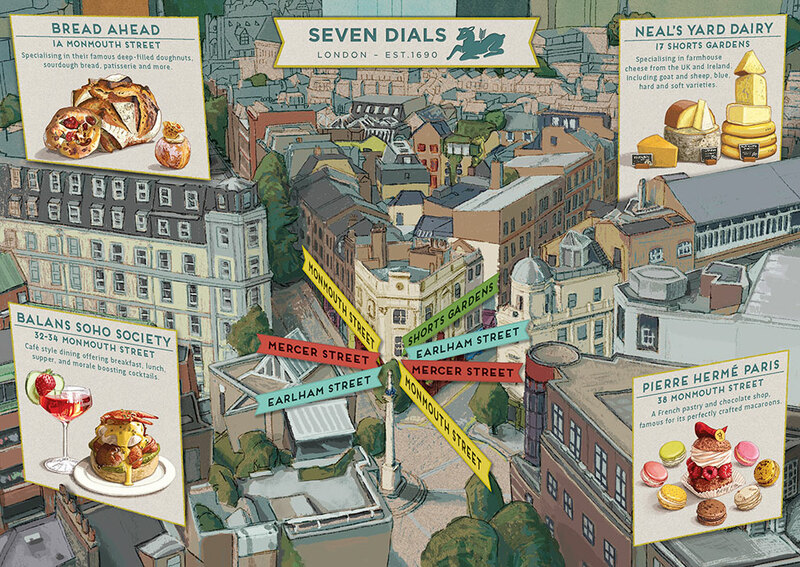 Making the food images fit onto the street view was a challenge- should they be put on straight? angle as the streets, like giant billboards. A portrait of St. Vincent. 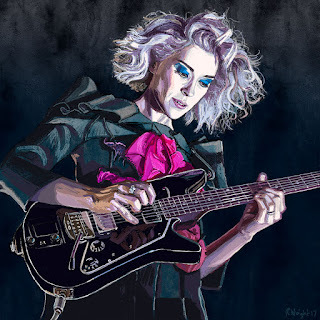 My latest portrait is St Vincent, also known as Annie Clark. She has a stark look to her image, and I really wanted to portray it. 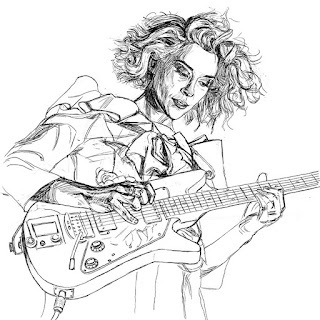 After some research the drawing took a change in direction when I found a great image of her on stage playing her guitar, the dramatic lighting giving her hair a 'mad scientist' quality. The drawing took some time, portraits never get any easier. I had to draw the face at a normal angle because the angles and features can get out of kilter, but afterwards turned it back to the original angle. The most fun was putting the colours on, and how the subtle shades and tones work next to each other. Also, I held back on too much detail because the most interesting qualities of the picture were the stark colours and dramatic lighting. 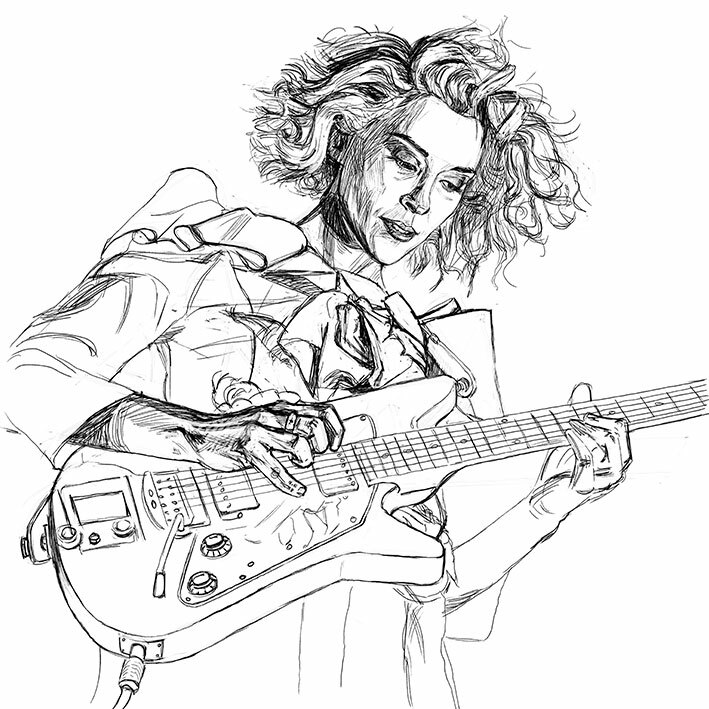 The guitar is mostly a white line because I wanted the focal point to be her blue eye shadow. Her hair was a lot of fun to paint, there were some really unexpected colours in the shadows, and making it 3d drew my eye even further into the picture. blurred on the photo, so I had to use my hand as a model and blur it a little.